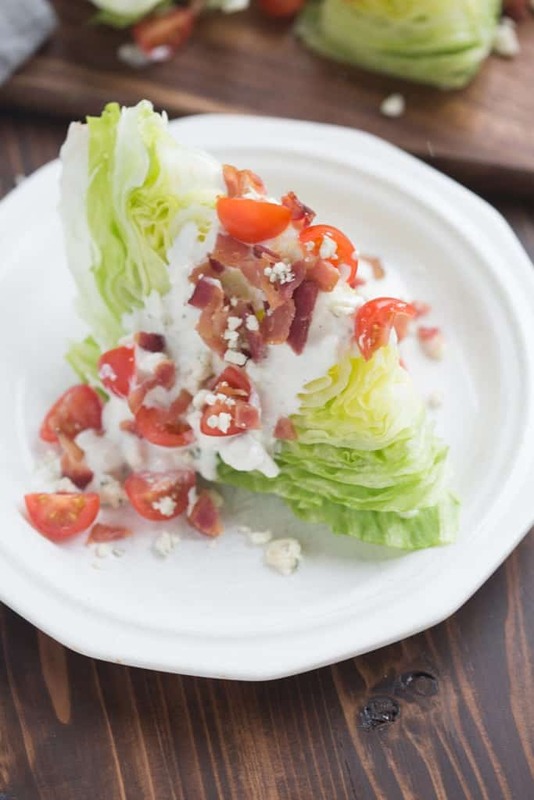 Classic Wedge Salad loaded with bacon, tomatoes and a creamy, insanely delicious homemade blue cheese dressing! 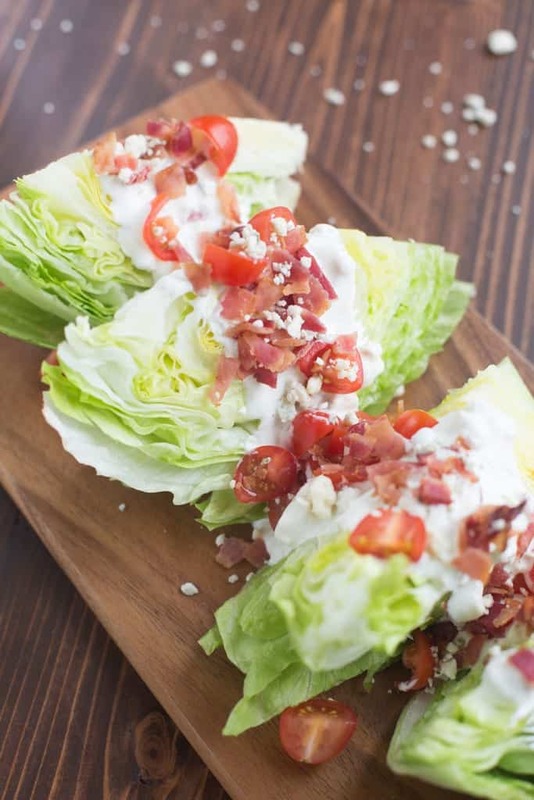 Whenever I’m ordering a side salad from a restaurant I always scan the menu for a wedge salad. They are my favorite! Which is really silly because they are probably the cheapest, simplest thing on the menu. But, for some reason they seem “fancy” to me and I love seeing how they’re presented. Plus, they just always sound good! My favorite part of this salad is definitely the EASY homemade blue cheese dressing. If you don’t love the taste of blue cheese you can make it to your preference by adding as much or little blue cheese crumbles as you want. Sometimes I substitute gorgonzola for the blue cheese, since it has a milder taste. It’s delicious either way. This entire salad takes only a few minutes to throw together, and unlike other salads, you could completely make it and add the dressing a few hours in advance, without the lettuce getting soggy. This is the perfect salad for impressing guests, with little effort. Add all of the dressing ingredients to a medium bowl and stir well to combine. Refrigerate for at least 30 minutes, or can be made several days in advance. Cut the iceberg lettuce in half. Cut each half into about 4 wedges each. Place wedges on individual plates. 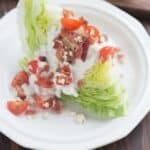 To serve, spoon dressing over lettuce and then sprinkle the bacon crumbles, tomatoes, onion and blue cheese crumbles on top. Garnish with fresh crushed black pepper, to taste. Awesome! I would love to hear how you like it! Those dates are finely chopped and add a delicious taste to it! Thanks for the recipe!